With so many Windows features, you’re bound to run into something that doesn’t work right or isn’t easy to figure out. One of the best ways to solve problems is to connect to Remote Assistance and watch while a more experienced friend sorts it out. Choosing Start→Control Panel→System and Security→System→Remote Settings. Be sure the Remote tab of the System Properties dialog box is showing. Select the Allow Remote Assistance Connections to This Computer check box and then click OK. The System Properties dialog box will close. Open Windows Help and Support. 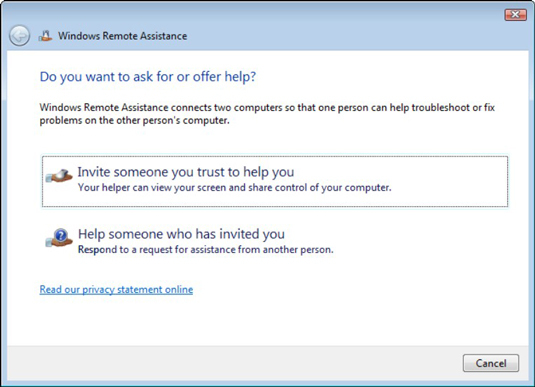 Click the Ask button and then click the Windows Remote Assistance link. On the window that appears, click the Invite Someone You Trust to Help You link. On the page that appears, you can choose to use your e-mail to invite somebody to help you. Click the Send This Invitation as a File link to create a file that you can attach to an e-mail message. 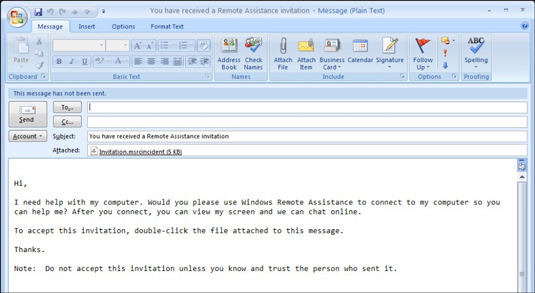 Click the Use E-mail to Send an Invitation link to send the invite as an email in a standard e-mail program, such as Outlook. Remember that it’s up to you to let the recipient know the password — it isn’t included in your e-mail unless you add it. In the Windows Remote Assistance window, note the provided password. Although using a password used to be optional in Windows XP, it’s mandatory in Windows 7, and the password you use must be at least six characters long. When an incoming connection is made, use the tools in the Remote Assistance window to control the session. You can find tools to adjust settings, chat, send a file, or pause, cancel, or stop sharing. When you’re finished, click the Close button to close the Windows Remote Assistance window. If you want to require a password, enter it and confirm it.